Download helpful e-books, videos, and more to learn all about amputation recovery and care for three legged dogs and cats. 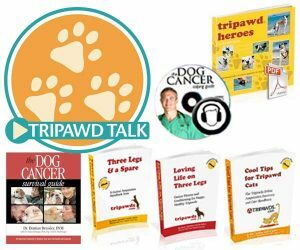 Get fast recovery and care tips in the Tripawds Library or learn everything you need to help your dog fight cancer. Find the best selection of podcasts, veterinary reports, studies and interviews about amputation and life on three legs. Subscribe to Tripawd Talk Radio wherever you enjoy podcasts! 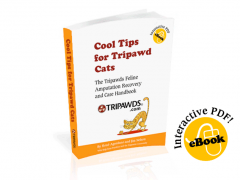 Download the Tripawds Library for fast answers to common concerns! Browse all products or search the Tripawds Downloads Blog for more free downloads, reviews and recommendations. Browse or search years of reviews for helpful three legged dog and cat amputation e-books, videos, podcasts and more! Get helpful recovery and care tips, and a FREE copy of Tripawd Heroes - filled with inspirational stories of dogs loving life on three legs!